International Socialist Review, issue 76, March-April 2011 -- Jeffery Webber believes that “the left-indigenous insurrectionary period” (2000–2005) was derailed by Evo Morales’s election, as “social movements demobilized” and “a moderate political party came to office”. While Morales’s government implements “reconstituted neoliberalism”, Webber believes hope lies in the “episodic strikes and other social movements” which “signal the renewal of collective action from the left of the MAS [Movement Toward Socialism]”. Any serious analysis of the dynamic of class struggle under the Morales government clearly contradicts Webber’s view. Rather than a shift “from rebellion to reform”, the trend has been one of a continuation of class struggle, albeit under different conditions. The Observatorio de Conflictos de CERES notes that no other government since 1970 (when it began collecting data) has experienced a higher number of conflicts. Like the conflicts between 2000 and 2005, these have tended to be fragmented, dispersed, and corporative in nature, in part the result of the continued extreme debilitation of the Bolivian Workers Central. The October 2003 and May-June 2005 national uprisings, which occurred during periods of extreme polarisation, were exceptions. This reflects the growing confidence of the popular movements that the government—or, more specifically, Morales—is much more likely to listen to their demands than to repress them. The conflict figures also reflect a rise in right-wing protests against the Morales government. Webber is completely silent on this, and on the September 2008 rebellion, when an alliance of US imperialism, pro-autonomy capitalist elites entrenched in the east, and key figures in the Bolivian military activated a coup attempt. Unleashing a wave of paramilitary violence (including attacks on police officers and soldiers, and the massacre of dozens of peasants in the state of Pando), fascist forces occupied almost 50 buildings belonging to state institutions, closed all airports in the four opposition-controlled eastern states, and shut down gas pipelines to neighbouring countries. Large agribusinesses cut food supplies to the majority Indigenous population in the west, and key military commanders in the east told Morales they would not obey orders to crush the rebellion. In response, Morales expelled the US ambassador and directly mobilised loyal soldiers to confront the paramilitaries. Simultaneously, and in coordination with the government, an alliance of peasant-Indigenous, urban poor and workers’ organisations mobilised to join with the resistance being waged by the newly emergent urban poor and workers’ organisations that had developed in the poorer areas of Santa Cruz city. With their plan unraveling, and tens of thousands of marchers approaching, the pro-imperialist alliance had no option but to surrender, a defeat they have yet to fully recover from. Webber ignores all this because it completely contradicts his argument. The Morales government represents a deepening, not a rupture, of the process that began in 2000. It is the result of the decision made by militant Indigenous, peasant and coca growers’ organisations, which had replaced miners as the vanguard of anti-imperialist struggle, to create their own “political instrument”. Faced with a complex and contradictory situation in which movements were able to bring down governments, but not yet replace them, the Morales leadership embarked on a strategy for power that combined street mobilisations, electoral campaigning around the key demands of the movements and corporative negotiations with worker/urban poor/neighbourhood-based and middle-class organisations outside the MAS, paving the way for the 2005 election victory. The result represented the rise of an alternative national project, a new “Indigenous nationalism”, deeply rooted in the aspirations of the Indigenous peasant-led anti-imperialist alliance converted into a revolutionary movement. One in which Morales undeniably plays a pivotal role in maintaining unity among the diverse sectors. Conscious of the fact that winning government is not the same as taking power and that the right wing would counterattack, the MAS leadership moved to consolidate its position by expanding its support base. For example, it nurtured the growth of emergent urban poor/workers’ organisations in Santa Cruz, forged in resistance against the eastern capitalist elites. Similarly, it worked hard to win over the military ranks and strengthen nationalist elements at all levels of the military. All of which enabled it to defeat the pro-imperialist coup attempt. Despite the fierce resistance it faced from day one, domestically and internationally, the Morales government has implemented numerous measures: strengthening anti-imperialist alliances with other governments and movements; expanding Indigenous rights; eradicating illiteracy; providing greater access to education and health care; and reducing poverty. Most importantly, it has fostered a powerful sense of Indigenous pride expressed through the now commonplace idea that the most marginalised and oppressed not only can govern the country, but can do so better than those who have come before. Webber’s misleading claims aside, change has also occurred in the economic sphere, starting with the fact that government policy is no longer dictated from Washington. The Morales government has pursued a line of increasing state intervention, expanding infrastructure, finding alternative trading partners to counter US sanctions and loss of trade preferences, dealing with the drop in remittances from overseas, and successfully steering the country through the world economic crisis. The response by foreign capital is far from the jubilation that one would expect if the government were implementing “reconstituted neoliberalism”. For example, since the failed coup attempt, net foreign direct investment has plummeted from US$253.2 million in the first quarter of 2008 to $45 million in the same period in 2010. Ignoring the numerous nationalisations and newly created state companies across a variety of sectors, none of which is the result of pressure from below via strikes or occupations, Webber focuses on mining to justify his position; unfortunately the facts prove just the opposite. Although the majority of active mines are in private hands, he points to no struggle for their nationalisation because he knows none exists. He mentions peasant and worker struggles against the San Cristobal mine, but evades the fact that there was no proposal from any quarters for its nationalisation; there is only a mild call to reform the current neoliberal mining code. Similarly, Webber provides no evidence of workers’ protests or occupations to demand the nationalisation of the Vinto tin smelter (not mine, as Webber says) because there isn’t any, while the case of Huanuni actually points in the opposite direction to Webber’s claim. At Huanuni, miners organised in cooperatives violently attacked workers at the mine in order to take it over for their own private benefit. 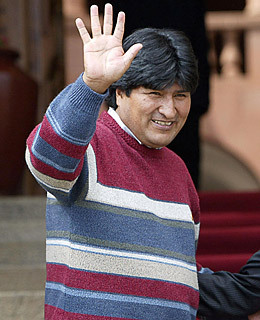 Morales fired the mining minister, who was aligned with the powerful cooperative sector, which includes some 75,000 miners (who had demanded control of the ministry in return for their support in the 2005 elections); replaced him with a former miners’ union leader, stating “until now we have not complied with the Bolivian people on the issue of mining”; and nationalised Huanuni. In almost all cases, the main peasant confederations have firmly sided with the government, reflecting a certain process of bureaucratisation of these organizations. Standing above all this, as a mediator between the competing interests, is Morales, whose political intuition continues to reflect the close link he maintains not just with union leaders but directly with the bases, through constant national, regional and local assemblies. For this reason, criticism is overwhelmingly directed at those around him. Furthermore, while some of these were important in shifting government policy to the left, there is no evidence of the emergence of any political challenge proposing a more “revolutionary” or “socialist” strategy opposed to that of the MAS leadership. In this context, the problem with the MAS is not that it is a “moderate party”, but rather that it is hardly a party at all. How to go from a MAS, which acts as an amorphous conglomerate of peasant/Indigenous/urban poor/worker unions lacking a clear strategic perspective or space to debate the way forward, toward the construction of a mass revolutionary party is a challenge that must be overcome. But the issue of revolutionary organisation is another thing that Webber, like his autonomist cohorts, is silent on. This has often been accompanied by internal conflicts between competing organisations, in some cases reflecting competing class forces and ideologies within the process, but more generally reflecting internal disputes over power sharing, a constant feature of the MAS and the Morales government. This means placing at the centre of our solidarity work opposition to US imperialism’s campaign against the Morales government and the revolutionary movement it rests on. Through its constant destabilisation campaign, the US has made clear that its central enemy is the Morales government, which today governs independently of imperialist interests. Mistaking localised corporative struggles—as legitimate as they may be—for the “cutting edge of anti-imperialism struggle” not only means missing who the real enemy is; it ignores the leadership role of the Morales government. It was not pressure from below that made Morales expel the US ambassador (yet to return), boot out the Drug Enforcement Administration, withdraw from the School of the Americas and campaign against US Agency for International Development funding to social organisations. Webber’s perspective is not only mistaken, it weakens the struggle to build a global movement that can resist imperialism and help free up space for revolutionary processes to advance away from dependency. A struggle in which the Morales government, forged in revolutionary confrontations and representing the broad aspirations of Bolivia’s Indigenous majority, is today playing a vanguard role, as demonstrated by the Cochabamba peoples’ summit on climate change and its recent intervention in the Cancun COP16 summit. Cited in “Los conflictos y la economia”, Fundacion Milenio, Informe Nacional de Coyuntura No 26, 17/7/09 and “Los conflictos sociales y el crecimiento economico”, Fundacion Milenio, Informe Nacional de Coyuntura No 65, September 17, 2010. As a result of the 1985 defeat suffered by the tin miners, the COB’s historic backbone, and subsequent restructuring of the workforce under neoliberalism, Bolivia’s once all-powerful union confederation is today a shell of its former self, maintaining little more than a symbolic presence in protests. See for example Tom Kruse, “Transicion politica y recomposicion sindical: Reflexiones desde Bolivia”, in Enrique La Garza Toledo, Los sindicatos frente a los procesos de transición politica, CLACSO 2001; Alvaro Garcia Linera, “Los ciclos historicos de la condicion obrera minera en Bolivia (1825–1999)”, in Revista Umbrales, 2000; Alvaro Garcia Linera, Marxa Chavez Leon, Patricia Costas Monje, Sociología de los movimientos sociales en Bolivia: Estructuras de movilización, repertorios culturales y accion politica Diakonia/Oxfam 2005, in particular the chapter on the COB. A good analysis that extends this analysis to the period under the Morales govenrment is developed by Bruno Fornillo, “Proletariado minero, nacionalización económica y el reposicionamiento actual de la Central Obrera Boliviana”, Polis, Revista de la Universidad Bolivariana, volumen 8, no 24, 2009. During his first term, Morales participated in 2374 meetings with difference organisations, a figure unimaginable under previous neoliberal governments. Of agreements reached between the government and unions/social organisations, around 75 per cent have been carried out. Del Estado Colonial al Estado Plurinacional, Direccion Nacional de Comunicación Social, 2010, 81. For more information on the coup attempt and its defeat see Federico Fuentes, “Bolivia: Indigenous government defies U.S.-backed fascists”, Green Left Weekly, September 20, 2008; Federico Fuentes, “Bolivia: Right-wing push to stop change defeated”, Green Left Weekly, October 25, 2008; Alvaro Garcia Linera Cómo se derrotó al golpismo Cívico — Prefectural, Discursos y Ponencias no. 3, Vicepresidencia de la Republica, October 23, 2008; Hugo Moldiz, Bolivia en los tiempos de Evo: Claves para entender el proceso boliviano Ocean Sur, 2009; Stella Calloni, Evo en la mira: CIA y DEA en Bolivia; Walter Vasquez Michel, “Operación Media Luna, el golpe de Estado contra el president Evo Morales”, La Epoca, September 28, 2008; Cesar Navarro, Gustavo Torrico, Gabriel Herbas and Rene Martinez, “Golpe civico prefectural marcha en Bolivia con apoyo del Embajador de los EE.UU”, La Epoca, September 14, 2008. Principally the United Union Confederation of Peasant Workers of Bolivia (CSUTCB), the Union Confederation of Colonizers of Bolivia (CSCB), which in 2008 changed its name to Union Confederation of Intercultural Communities of Bolivia (CSCIB), the National Federation of Peasant Women of Bolivia (FNMCB), which in 2008 changed its name to National Confederation of Peasant, Indigenous and Native Women of Bolivia (CNMCIOB) and, most importantly, the coca growers federation of the Chapare. This process also involved, though to a lesser extent and in a more complex way, the Confederation of Indigenous Peoples of Bolivia (CIDOB) and the National Council of Ayllus and Markas of Qullasusyu (CONAMAQ). Reflected in, among other things, the lack of any serious signs of disintegration within the capitalist army or the emergence of an alternate armed force based on worker/peasant militias that could militarily defeat the capitalist state, as occurred in the 1952 National Revolution. Numerous articles on this issue can be found by searching for “military” at Bolivia Rising (http://www.boliviarising.blogspot.com). Contrary to Webber’s claim that poverty has not been reduced, figures from the UDAPE note that from 2005 to 2009, the poverty rate dropped 2.3 per cent (3.8 per cent in rural areas) and extreme poverty dropped 6.3 per cent (10.2 per cent in rural areas). See “The Bolivian economic performance and investment program 2010–2015”, Ministerio de Economia y Finanzas Publicas. Such trade represented 8.3 per cent of Bolivia’s exports in 2005. Cited in Mark Weisbrot, Rebecca Ray and Jake Johnston, Bolivia: The Economy During the Morales Administration, CEPR, 2009. Banco Central de Bolivia. In comparison, public investment increased from US$98.6 million to $163.5 million in the same period. See for example the booklet Minando el Agua: La mina San Cristóbal - Bolivia produced by the main local peasant organisations FRUTCAS and FSUMCAS. The government itself has already begun drafting a new mining law, in consultation with all sectors. See Bruno Fornillo, “Proletariado minero, nacionalización económica y el reposicionamiento actual de la Central Obrera Boliviana”. For example, workers’ protests for wage increases in May, mobilisations by Indigenous organisations from the east in June, and the rebellion in Potosi in October (see Federico Fuentes, “Bolivia: When fantasy trumps reality,” Green Left Weekly, April 22, 2010; Federico Fuentes, “Social Tensions erupt”, Green Left Weekly, August 15, 2010). Herve Do Alto and Pablo Stefanoni, “Las ambivalencias de la democracia corporativa”, Le Monde Diplomatique, Bolivian edition, May 2010. As an example, see how Indigenous organisations that are constantly announcing their break with the MAS used the last protests to demand their own ministers (See “APG reprueba a 15 Ministros de Morales y Conamaq a 16”, Erbol, January 5, 2011). “We will defend this process as we always have, including with our live ... we are the owners of the process of change”, said peasant union leader Roberto Coraite, explaining why the CSUTCB was supporting the removal of subsidies on fuel. “Los campesinos apoyan la nivelación del precio de los carburantes”, Cambio, December 30, 2010. While factory workers’ union leader Vitaliano Mamani accused the minister of economy of being an agent of the right trying to bring down the government, FEJUVE president Claudio Luna said that the measure was the result of ministers “making decisions that are undermining support for the government of president Evo Morales” (see “Fabriles culpan al ministro Arce Catacora por el ‘gasolinazo’”, ANF 28/12/10; “Ampliado de FEJUVE El Alto, exige renuncia Vicepresidente Linera y 2 Ministros”, Radio Atipiri, December 28, 2010). For example, Webber has described the protests in Potosi as a “break with the MAS” and argues that “the government’s populism will be unable to contain the growing discontent from urban and rural popular classes”. Yet he acknowledges that the demands of the protests were resolution of a dispute over borders and control of a mineral-rich mountain with neighbouring Oruro; installation of a cement factory; reopening of a state-owned metal processing plant; preservation of the over-mined Cerro Rico; an international airport; and more highways. It is hard to see how this represents a break with “populism”, let alone capitalism (see Jeffery Webber, “The rebellion in Potosí: Uneven development, neoliberal continuities, and a revolt against poverty in Bolivia”, Upside Down World, August 16, 2010). While Webber refers to “three principal intellectual camps” in Bolivia, the third group is made up of a disparate group that include intellectuals living outside of Bolivia, at least half of whom self-identify as anarchists/autonomists (Raquel Gutierrez Aguilar, Raul Zibechi, Forrest Hylton, Sinclair Thomson); local autonomists (Jorge Viana); the editorial board of a magazine that promotes “dispersed originary indigenous anti-power visions”, according to its first issue (the list of contributors to Willka); and a group of researchers linked to the same NGO (CEDLA—Enrique Ormachea Saavedra, Lorgio Orellanoa Aillon, Silvia Escobar de Pabon). Federico Fuentes has done important work in Latin America over the last number of years, bringing to the Anglophone world regular updates and translations from Caracas on Venezuelan developments, maintaining an important news resource on Bolivia, http://boliviarising.blogspot.com/, and providing analytical dispatches to the Australian newspaper, Green Left Weekly. In Caracas, he has worked closely with Chilean socialist Marta Harnecker and the Canadian Marxist Michael Lebowitz—both of whom have acted as advisers to Hugo Chávez—at the Centro Internacional Miranda. Fuentes also recently joined the editorial board of Marea Socialista, or Socialist Tide, in my estimation the best single source of commentary on the unfolding political processes in Venezuela under Chávez. As an activist, furthermore, Fuentes has participated in vital educational work on the Bolivarian process through lecture tours in Australia and Canada, and probably a host of other destinations of which I am unaware. “Contrary to Webber’s claim that poverty has not been reduced,” Fuentes notes in footnote 9 of his response, the “poverty rate dropped 2.3 per cent (3.8 per cent in rural areas) and extreme poverty dropped 6.3 per cent (10.2 per cent in rural areas).” Here, Fuentes draws on data unavailable to me at the time my text was composed (I had reliable figures only up to 2007). I wrote the following in my original article, in footnote 21: “It is possible that poverty levels have improved since 2007, and it should also be noted that these figures do not take into account improvements in the social wage of workers and peasants—i.e., any improvements in social services for the poor.” So was it me then, or is it Fuentes now, who is “misleading”? I am said to belong to a cohort of autonomists who don’t understand, or who are uninterested in revolutionary organization. “But the issue of revolutionary organization is another thing that Webber,” Fuentes suggests, “like his autonomist cohorts, is silent on.” First, unlike Fuentes, I don’t dismiss entire traditions because I disagree with them on some central strategic questions. There is much for revolutionary Marxists to learn from Latin American anarchism and autonomist Marxism. Second, Fuentes crucially misunderstands the fact that I don’t see the MAS as a revolutionary socialist party for a position against revolutionary socialist parties per se.